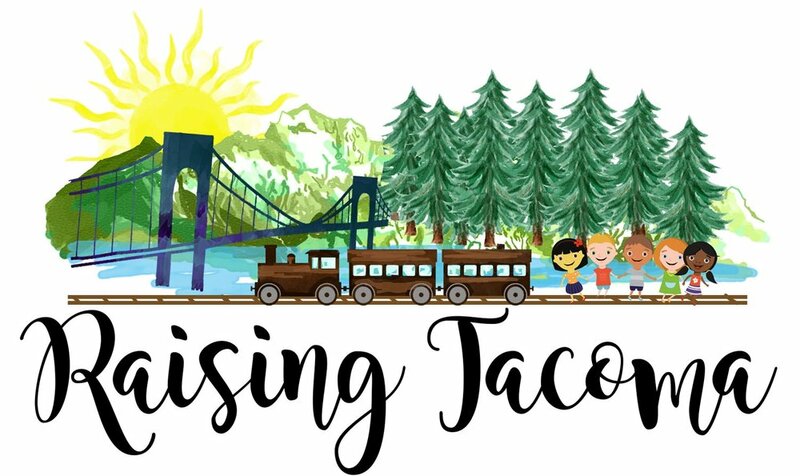 Hey Heather, Now that you're getting married, what are you going to doing next? Remember that wonderful line? No? Let me spark your memory. I just remember my sister and I used to always joke with this line. 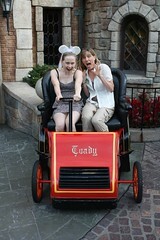 But this time I really did go to Disneyland (okay, land not world. But we all know Disneyland is better). 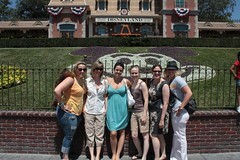 Yes, that's right, I went to Disneyland for my bachelorette. I have to say, it was quite an awesome idea. Where else better to celebrate than the happiest place on Earth? It's a no brainer. 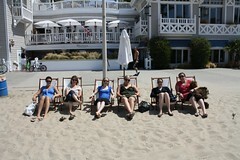 My bachelorette crew: Heather (me, of course! ), Lindsay, Heather R. Melissa, Alley, and Tori. The fun started on Friday evening after we all had made our way down to LA area (I actually went down Thursday evening and worked from Lindsay's apt on Friday). Lindsay and I drove to LAX to pick up the gang. LAX was a zoo, but we managed to get to Heather Richardson's house without an issue. We started our weekend with chit chat and mojitos! Saturday was the BIG day - Disneyland. We had a leisurely morning and then we were off to party hard. We bought our tickets (ouch) and headed inside. First things first, I got a special hat. 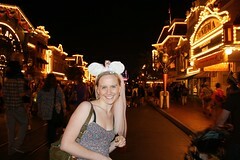 It was a hard choice between the felt mouse ears or the handband. The felt I could have embroidered "Bride-to-be" or something cheesy, but the handband was cutier. I went with cuter. 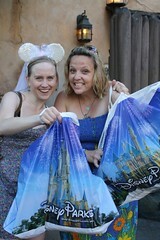 Once our mouse gear was on our heads (we also got special "celebration" buttons to wear), we were off to Indy. Indy? Indiana Jones (Tori knows him as Indy; apparently they are on a first name basis). I guess I should go back to driving school because I gave these girls a ride for their money. I tell you it's hard to drive in the dark and across a fake bridge near snakes and rolling boulder. (Only those that have been on the ride will understand those last sentences). Next we hit up a few more rides: Pirates, Captain EO 3D (oh yea baby; it's back), Big Thunder, Haunted House, Space Mountain...all the big rides. And then there was Splash Mountain. Now, I've gotten wet before, but never have I come out thinking I jumped into the river. Alley and I were the two front loggers and got utterly wet. In fact, so wet that we deemed it appropriate to purchase new dresses! And, for me, a sweater as well. You would think after all that, we would be tired out. Oh no. 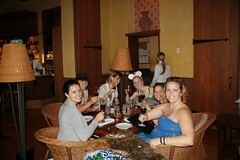 We replenished our energy with a fabulous meal at Catal in Downtown Disney and then we were back at the D-land. This time we tried out the much improved Star Tours, saw some elephants on the Jungle Cruise, and some more pirates on Peter Pan. In between we saw glimpses of fireworks. And that, my friends, is a full day at Disneyland. Go Girls! Day two was a bit more low key. Then again, anything is low key compared to the awesomeness that is Disneyland. 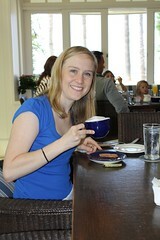 We did brunch at Coast in Santa Monica on the beauiful beach. With coffee in hand, I was a happy girl. Or was I happier sitting on the beach in the sun (replenishing my Vitamin D)? Tough decision. Either way, it was a lovely morning. We ended the fabulous weekend crusing cute shops on Main Street in downtown Santa Monica. Sadly, all things must come to an end, and we all parted our ways. Melissa, Tori, and Alley back to the bay area. Lindsay to South Pasa. Heather to Bel Air. Me to Seattle. What a freakin' awesome weekend!